The peaceful atmosphere that Rumah Boedi Private Residences offers was exactly what we needed after long hours of traveling and lack of sleep. 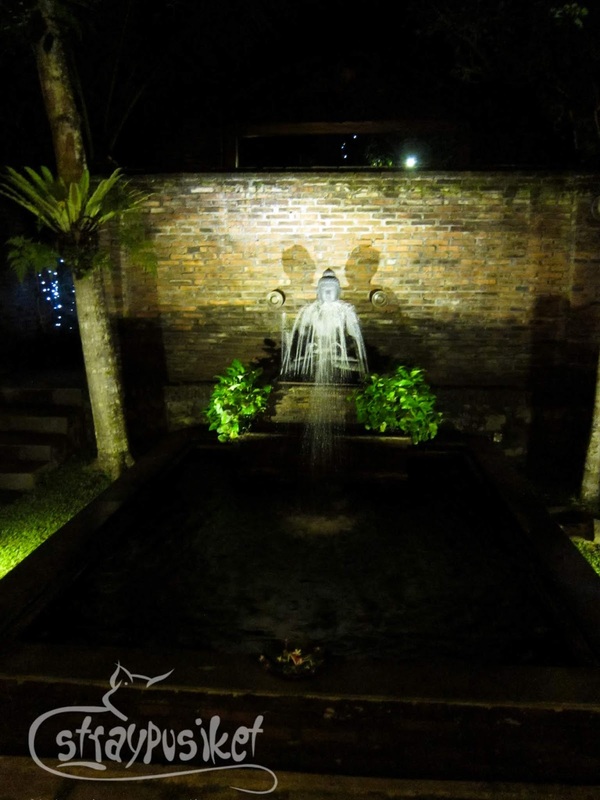 The dimly lit pathways, plus the sounds of various insects and flowing water from the fountain, makes you think you're in a spa. 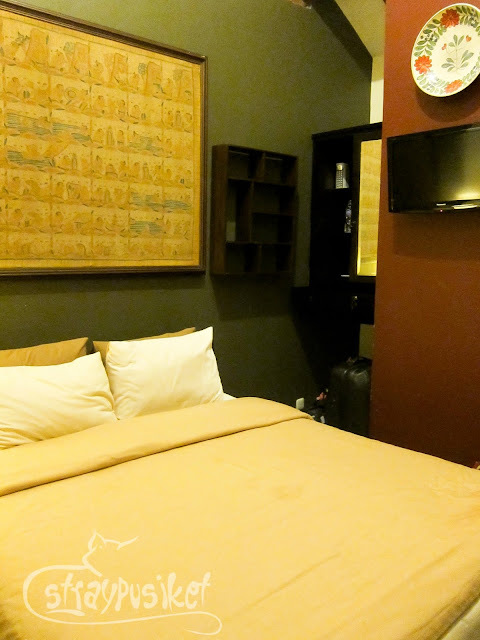 I chose this over the more popular Manohara hotel since it's much much cheaper. Though Manohara is the only hotel located inside the Borobudur complex, we didn't mind the 5 minute ride going there from Rumah Boedi. I booked this hotel via Agoda. They have a promo that time so we got the studio rooms at 54% off the standard price. We only paid $84 for 2 studio rooms. Wisnu (our driver) was not familiar with the hotel but he managed to locate it after giving to him the address. The hotel is not on the main road so we might have difficulty finding it if we were on our own. It is stuck in the middle of a residential area about 5 minutes away from the main road. We arrived around 7PM and the staff were expecting our arrival. Before we left for Indonesia, I left a message to the hotel that we will be checking in late. This was our new room right after requesting to be transferred since the beds on the first rooms that were given to us were damp due to some water droplets coming from the ceiling. It may not be wise to hang the TV in that location but who cares to watch TV when you're dead tired and most of the very few channels are in Bahasa language? Loving the floral plate though. 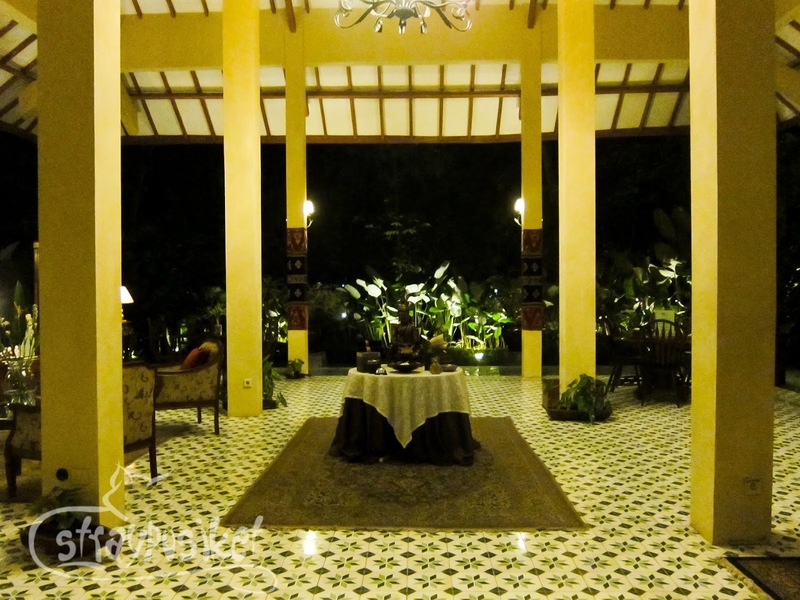 Each room has its own gate and a separate door that opens up to a private garden. 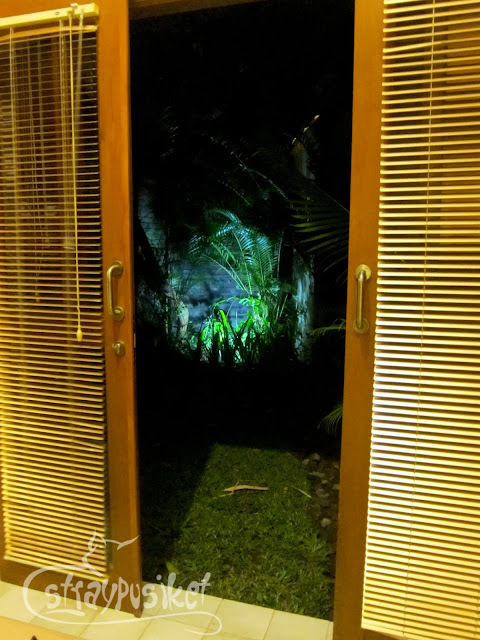 Wait, is that a face behind the plants? The lighting on the garden gave an eerie feeling add to that the deafening quietness in the resort. I wanted to turn of the light but I failed to locate the switch so we just shut the blinds to avoid seeing ghosts showing up in the garden. Hahahaha! I took this photo while sitting on the bed just to show you how small the studio villa is. The hotel didn't have any other amenities besides their restaurant and WIFI in rooms but if you're just there to spend the night, then this hotel is a good option. Plus, the breakfast is good.